It’s #ThrowBackThursday and we’re throwing it back to 1998. 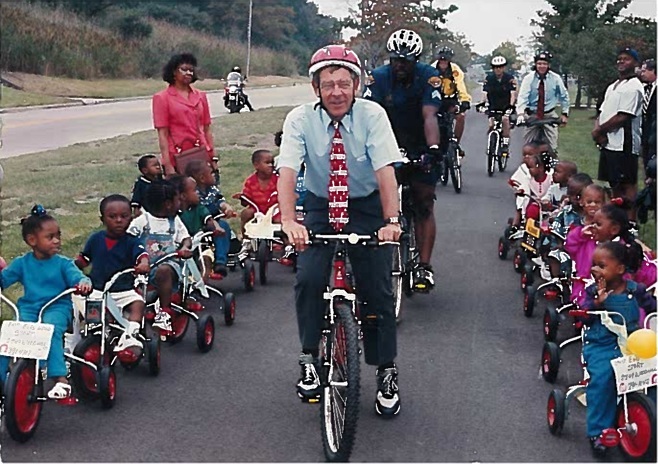 This picture of Senator George Voinovich, taken by Donn Nottage, Chief Photographer for the City of Cleveland, shows Cleveland’s former mayor with students and staff from The Council for Economic Opportunities’ East End Head Start center. It was taken at the dedication of the newest phase of the Harrison Dillard bike path that runs through the Cleveland Cultural Gardens. After he served as Cleveland’s mayor, Voinovich became the governor of Ohio before serving two terms in the U.S. Senate. He was known as a unifier, and a great champion for Head Start. Voinovich died on June 12, 2016. He was 79. His memory will live on through our Head Start children and families.